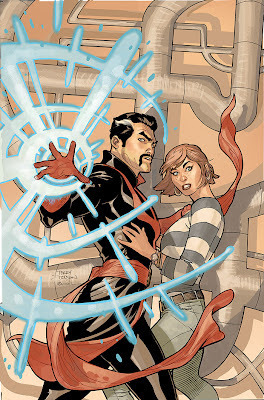 I think it is very cool that real life husband and wife, Terry and Rachel Dodson, team up to make such great comics together. Terry draws in pencil and Rachel inks them. The end results are fantastic. I have really enjoyed their Wonder Woman run, X-men stuff, Spiderman, but my most favorite of all are the new Defenders, which are written by Matt Fraction (mostly because I’m a sucker for Silver Surfer and Doctor Strange). Defenders is one of the best comics of the year so far, cosmic and quirky—lots of fun all around. 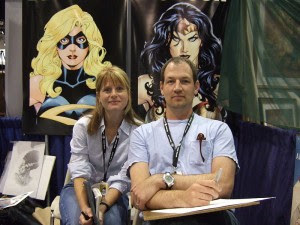 The Dodson’s are scheduled to be at the upcoming Emerald CityComicon (ECCC 2012) here in Seattle at the end of March. I’m hoping to meet them and ask what it is like having all that talent under one roof. Three Geek Cheers for the Dodsons! Their work is definitely worth Geeking Out About! If you have time, Sign Up for our LarsenGeekery Mailing List. Get valuable coupons. Visit our LarsenGeekery Store. You win, we win. Or Like us on Facebook. It's a social thing. Dr. Strange is just plain badass. He looks cool, he's the Sorcerer Supreme, and his powers pretty much make him a god of sorts. I like Doctor Strange a lot as well. Although very few writers have done him justice. He is no longer the Sorcerer Supreme these days. He lost the job because he broke the rules to save his friends lives. But I kind of like him more these days as a free-lance sorcerer. He is still out there trying to save the world.